If you would’ve told me back in 2014 that one of the year’s best films would be a licensed animated cartoon based on LEGO construction block toys of most people’s youth, it would’ve been a hard sell. Licensed animated films don’t have a great track record as far as quality cinema goes and for every Transformers the Movie that you might claim is a quality film, there’s a Squeaquel to counter. But The Lego Movie was full of heart, a story about the importance of individuality told through the lens of a father/son story many could relate to in the age of the adult toy collector. The film ended with a gag featuring Lego’s famous Duplo toys and few could have anticipated that a sequel to the film would lean into that hard and make a story just as heartfelt and universal as that of the original. But shockingly, The Lego Movie 2The Second Part manages just that; a direct follow-up to the film that speaks to universal themes of growing up and adolescence, while still giving us a great comic book style fantasy adventure that stays true to the spirit of the original film. The Lego Movie 2 starts exactly where the first left off, with the Duplo aliens arriving in Bricksburg. Emmet (Chris Pratt), the hero of the original, offers the Aliens a heart made of bricks as an olive branch, but the tensions between the Lego citizens and the Duplo aliens erupts. The overly-cute Duplo creatures are impervious to weapons and President Business (Will Farrell) is an absentee landlord letting the 2 have their battle royale. Time passes, and BricksBurg has become a Mad-Max like Apocalypseburg full of the kinds of gritty, badass versions of childhood favorites most teens would conjure to keep their collections and favorites relevant as they age. Meanwhile, Emmet is just as cheery and optimistic as ever, which makes him the odd man out once again in a world where Batman (Will Arnett) is a post-apocalyptic daimyo and even Liam Neeson’s Good-Cop has echoes of Fury Road. In this landscape, the Lego citizens are visited by General Mayhem (voiced by Brooklyn Nine Nine’s Stephanie Beatriz), who is tasked to bring the leader of the Lego civilization to the Sistar system for a marriage ceremony with the shapeshifting Duplo Queen Watevra Wa’Nabi (Tiffany Hadish). Their encounter ends with Wildstyle (Elizabeth Banks), Spaceman (Charlie Day), Unikitty (Alison Brie), Metalbeard (Nick Offerman), and Batman in the clutches of the Duplo. It is up to Emmet to try and save his friends and, at the same time, try and grow up to face the changing world around him where everyone is becoming more grown-up and the stakes of everything are much more apocalyptic and adult. On its surface, Lego Movie 2 seems simple, but much like Disney-Pixar’s Toy Story films, Phil Lord and Christopher Miller imbue these tales of role-play surrogacy with a deeper, universal meaning. There’s always a tension between growing up and wanting to go of childish things and be a grown up as a child grows older and that paradigm is one that is heavily focused on in this film. All of Emmet’s friends are growing up and becoming more broody and independent. Meanwhile, Emmet struggles to be tough and cool enough to match up to Wildstyle, who worries that Emmet just isn’t adapting to the changing world around him. Along the way, Emmet makes friends with characters like Rex, a long-haired stubbly cool space explorer with pet raptors who shares more than a few features with some of Chris Pratt’s most popular characters with a heavy dose of Kurt Russell’s Jack Burton thrown in for good measure. The film makes a case to its audience whether its better to be a happy individual who might not be that cool, versus being a surface-level cool character who is angry and alone. These moments spark good conversations and ideas with kids and reinforce some of the great character moments of the original Lego Movie. Meanwhile, the “real world” storyline mirrors and enhances this plot, making for a solid foundation for good storytelling. This is bolstered by great character voice work by the film’s principals. Pratt pulls double-duty to great effect, but the film’s grouping of Hadish’s Queen with Arnett’s Batman strikes pure-gold. The Lego Movie 2 features many musical numbers, but its standout has to be “Gotham City Guys” where Arnett and Hadish duet to hilarious and heartfelt effect. While the Lego Batman Movie was a lot of fun, it didn’t have the emotional resonance that The Lego Movie did. 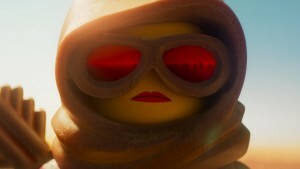 The Lego Movie 2 is all heart, with great animation, a focused story, and great character development that in many ways tops the original and puts it in the pantheon of films like Toy Story that really transcend the medium to tell a great universal story with staying power that will stuck in your head and heart.